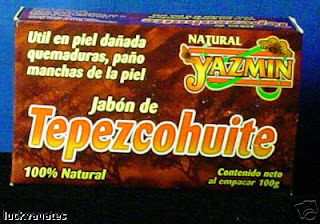 TEPEZCOHUITE SKIN CARE STORE: * TEPEZCOHUITE SOAP Acne Pimples Scars Oily Skin Blemish Psoriasis Eczema. the skin feeling revitalised, soft and supple. By its antibiotic and stimulating action, aid to regenerate the skin. *Exfoliates the skin leaving it soft and radiant. *Stops ACNE Dead In Its Tracks. *Diminishes scars, acne scars, dry skin, freckles. *Minimizes fine age lines and wrinkles. *Reduces age spots and pigmentation imbalances. *Reduces appearance of stretch marks & cellulite. *Removes all makeup including waterproof mascara. *Removes dirt, grime, oil that clog pores and cause acne. *Eliminates up to 99.9% of bacteria without chemicals. *Renews fresh skin tone for a more youthful appearance. *Treats skin damaged by long-term sun exposure. *Removes dead skin cells and dry skin flakes. *Help to Improve and Heal Acne, Pimples,Oily Skin etc. *Leaves Skin Smooth and Healthier. *Also Helps with to prevent the fails of the hair and to heal the Dandruff.